How's it going, folks? It's Gir Todafunk, Mr. 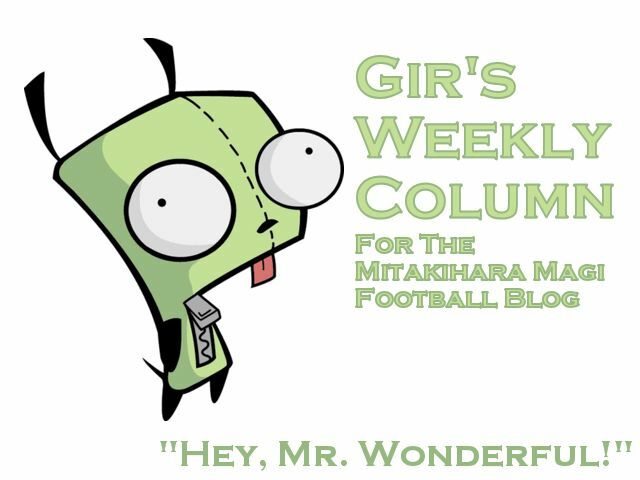 Wonderful, with another Weekly Column for the Daily Magi and the Magi Football Blog. It's been quite a long season, but we now have two more games to go: the conference championship game, and the bowl game. However, there are a few more teams that need to wrap up their regular season. One of them is the University of Texas. The Longhorns can clinch a spot in the BCS Championship game if they beat Kansas State. So all of us are donning purple Wildcats gear and cheering for Kansas State to pull off the upset. You see, if Kansas State defeat Texas, we are in the driver's seat, and we get bumped up to second in the rankings. Then if Miami falls the following week and we win, it could be Mitakihara-Notre Dame for all the marbles. So a lot of the people in South Bend are paying close attention to the scenes in Austin. They're also wearing purple too because they want to be in the BCS Championship game. Well, they're hoping for us to fall against Colorado State next week, but that's not gonna happen. We're not gonna fall for that. Don't get me wrong; I love the Rose Bowl, but it's not the BCS Championship Game. I'm here to win the big prize in my freshman year, and the Hurricanes and Longhorns are in my way. So, I'm picking Kansas State to deliver a monumental upset that will put the Best College Football Team in All of College Football even closer to the promised land. Practice was light this week. We only had to go through light drills, and some players from the sprint football teams also went through warmups. They just concluded another successful CSFL defense. Way to go, sprinters. Anyway, besides drills and some conditioning, we spent the week watching game film on Texas, Miami and Notre Dame. We're not too worries about UCLA at this point; we're more concerned about those three opponents. Mood's been pretty good; there's been plenty of good joking and jabbering, and some of the seniors decided to clown around on the Hakurei turf, which will soon be rose-colored next year. Anytime you have a team morale as high as ours, you feel like you're ready for the next game, and we're ready to shear the Rams next week. So, with that said, this concludes a brief Weekly Column from yours truly. Look forward to next week, when we get ready for Colorado State. This is Gir Todafunk, Mr. Wonderful, signing off. You are not alone.